Past tragedies caused by "miracle drugs" have taught the public to approach cures with caution, and vaccines, in particular, have come under public scrutiny. In The Virus and the Vaccine, journalists Debbie Bookchin and Jim Schumacher uncover the true tale of the polio vaccine and its past and present dangers. Like many medical detective stories before it, this book starts with a chilling anecdote, then flashes back to slowly set the stage for disaster. Baby boomers who only know Jonas Salk and his virus-fighting colleagues as heroes will be disturbed at how some of them downplayed concerns about a monkey virus called SV40 that was present in the polio vaccine. The links between SV40 and human cancer took a long time to define, and breakthroughs in molecular biology made the job more realistic in later decades. Nevertheless, Bookchin and Schumacher argue that a biased scientific bureaucracy in combination with a desperate public and money-hungry pharmaceutical! companies fostered the use of a vaccine that may have increased cancer risk. "The vast majority of baby boomers--almost all of whom received polio vaccine in the late 1950s and early 1960s--have potentially been exposed to the virus," they write. But baby boomers aren't the only ones at risk. The authors reveal that Lederle Laboratories continued to produce potentially contaminated oral polio vaccines well into the 1990s. Although the authors point fingers of blame at some specific targets, they carefully balance their accusations with reminders that public demands for cures must be balanced with careful assessment of new medical treatments. --Therese Littleton --This text refers to an out of print or unavailable edition of this title. 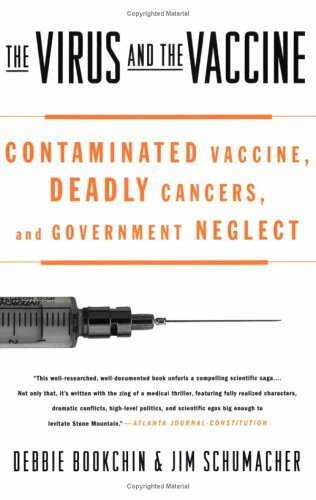 Journalists Bookchin and Schumacher argue that for nine years, from 1954 to 1963, almost every dose of polio vaccine produced in the world (and the 98 million Americans who received polio vaccinations) was contaminated with a cancer-causing virus from the monkey kidneys used to develop the vaccine. Although the polio vaccine developed by Dr. Jonas Salk virtually ended polio as a threatening disease, the authors detail how "the screening techniques and observation periods that Salk and the vaccine manufacturers employed were not capable of always catching the contaminants." This sordid story spells out how repeated research studies showing that the "SV40" virus was in the vaccine were dismissed by federal health officials, so that "there would be no warning to consumers that the vaccine they and their children were receiving contained a live monkey virus whose effect on humans was entirely unknown." In the second part, the authors contend that even today such organizations as the National Institutes of Health continue to dismiss study results, even though numerous studies have shown that SV40 is capable of causing cancer in humans. The final and most horrific part of the story reports that Lederle Laboratories, the sole oral vaccine supplier in the U.S. from 1977 onward, continued to use monkey kidneys possibly infected by the SV40 virus in its manufacturing process until oral polio vaccine was removed from the market as late as January 2000. This meticulously researched, levelheaded and well-written book should stir up considerable debate. Because the authors never become alarmist, this solid work of investigative reporting carries considerable weight, and deserves to be read by a large audience.